This PDF file has a few pages from the book, Historical Sketches of Virginia, Cass County, Illinois. It was published in 1907. The pages are shown that have Supplina Judd's name on the Virginia, IL Voter Rolls in the 1840's. There is a page on Rev. William McCord. William McCord was an early Presbyterian minister who founded a congregation in the area and died in 1833. We suspect that John and Altha Hamilton named one of their twin sons born in 1834, William McCord Hamilton after this person. This is page 376 of this turn of the 20th century work written by Civil War veterans in remembrance of their beloved Illinois infantry regiment. At the bottom of this page and the top of the next is mention of the Hamilton twins, James and William. These were the younger brothers (two years) of Supplina who were heros in the war on the Union side. This is page 377 of this turn of the 20th century work written by Civil War veterans in remembrance of their beloved Illinois infantry regiment. At the bottom of this page and the top of the next is mention of the Hamilton twins, James and William. These were the younger brothers (two years) of Supplina who were heros in the war on the Union side. This document written in 1955 remembers the history of this pioneer church founded in 1827. It is very likely that John and Altha Hamilton were members of this congregation. One of the founding ministers was William McCord. He died in 1833. In 1834 John and Altha named one of their newborn twins William McCord Hamilton, very likely, in honor of Rev. William McCord. Laura Harrison shared this scan of an article by Inabel Fish on the history of the Wauconda, WA cemetery. It's very interesting. In this cemetery is interred James Watt Ramsay (grandfather of Elsie Luetta [Galloway] Hamilton) and Effie Galloway (baby sister of Elsie). There is also a Charles Spaulding interred, who we believe is a relation to James Ramsay's wife, Mary Adelaide (Spaulding) Ramsay. There is also mentioned a burial of a baby Galloway in among the 'scattered' graves. This is thought to have been a baby borm to a daughter of Amasa and Elizabeth Galloway who is buried on or near the Galloway homestead in the Wauconda area. The full title of the book this article appears in is: Trails and Tales of The Early-Day Settlers Of North-Eastern Okanagon County Washington. This PDF file is a scan of page 8 of the Morning Oregonian, Portland, Oregon, published June 12, 1887. In column 2 under the heading: "Washington Territory - PIONEERS AND INDIAN WAR VETERANS" is an article on the meeting of the Veterans and includes a reference to a member, "S Hamilton, private, Co H Oregon Vols., 1855." This "S Hamilton" was Supplina Hamilton our ancestor and veteran of the Yakima Indian War of 1855/56. Supplina served in Company H of the 1st Regiment of the Oregon Mounted Volunteers. Jim was the son of William McCord Hamilton a younger brother (and Civil War veteran) of Supplina Hamilton. James and Mary Ramsay are the parents of Lily (Galloway/Fee) Ramsay who was the mother of Elsie (Galloway) Hamilton the wife of Maurice Hamilton. They lived in the Taroda Creek area near Wauconda, WA. 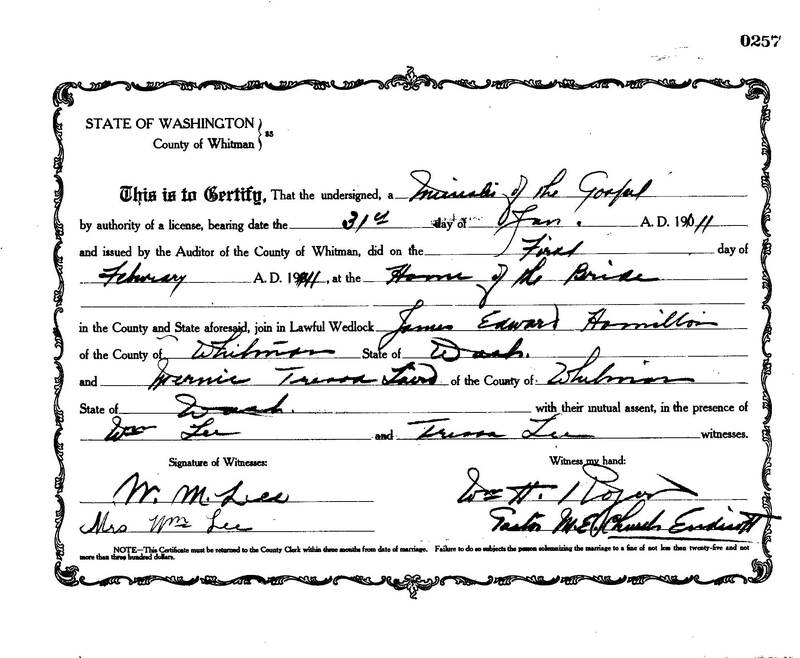 James died in 1904 and is buried in the Wauconda, WA Cemetary with his infant granddaughter, Effie Galloway. The family remembers James and Mary as having done well and had the luxury of a bank account. In mom's notes, she records the following: "Mary Ramsay had property in California which was sold and had considerable money in the bank, Farmer's State Bank in Tonasket." James and Mary A. (Adelaide) Ramsay (Spaulding) were married but had no children yet in 1870. Mary was only 18. They left for Washington after 1877 as their youngest child, Martha, is listed as 3 years old on the 1880 Census (when they were living near Buckley, WA) and as having been born in Missouri. Their older children are listed on the 1880 census as having been born in Kansas. It would appear then that they moved from Kansas to Mary's home state of Missouri before they emmigrated West to Washington. It is interesting that there is no mention of Martha after the 1880 census. Apparently she died. Lily, their last child was born in 1887 and was 10 years younger than her next older brother, Donald. The loss of Martha (and relative old age of James) may help explain the remembrance of the child Lily as 'the baby and her father's spoilt darling.' This impression was passed onto mom (Julia Hamilton) and recorded in her notes. Lily would eventually be the mother of Elsie (Galloway) Hamilton. James E "Jim" Hamilton and Mernie Hamilton lived with their son Edward near Espanola in 1920. Jim was the son of William McCord and Rosa L (Porter) Hamilton. William was the younger brother of Supplina Hamilton. James "Jim" and Mernie Hamilton lived on the farm near Diamond in 1930 where their grandson Clarence and great-(great) grandchildren still live today. Jim was the son of William McCord and Rosa L (Porter) Hamilton. William was a brother of Supplina Hamilton. James E Hamilton was the head of the household. His father, William McCord Hamilton had died in 1903. His mother Rosa L (Porter) Hamilton was 49 years old and living with James and the younger children. The other children at home were: William A, Albert R, Viola and Alice A and Alice's husband Howard Pewitheres (spelling?). James was the son of William McCord Hamilton. William was the younger brother of Supplina Hamilton. James is 28 and the unmarried head of the household. His mother Rosa and two brothers, two sisters and a brother-in-law were enumerated in the household. James Edward Hamilton was the son of William McCord Hamilton and Rosa Porter. 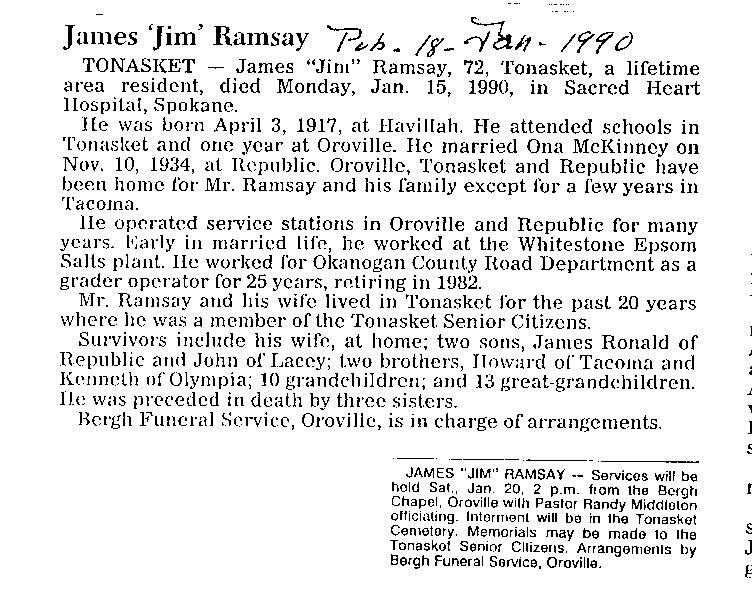 This is the obituary of James 'Jim' Ramsay of Tonasket, WA. Jim's obituary was published January 18, 1990. Jim was the son of George Ramsay and Lillian B. Wilson. Jim's grandparents were James Watt Ramsay and Mary Adelaide Spaulding who were pioneers in the Buckley, WA area and later in Okanogan County, near Wauconda and Havillah. Jim was a first cousin to Elsie Luetta (Galloway) Hamilton. 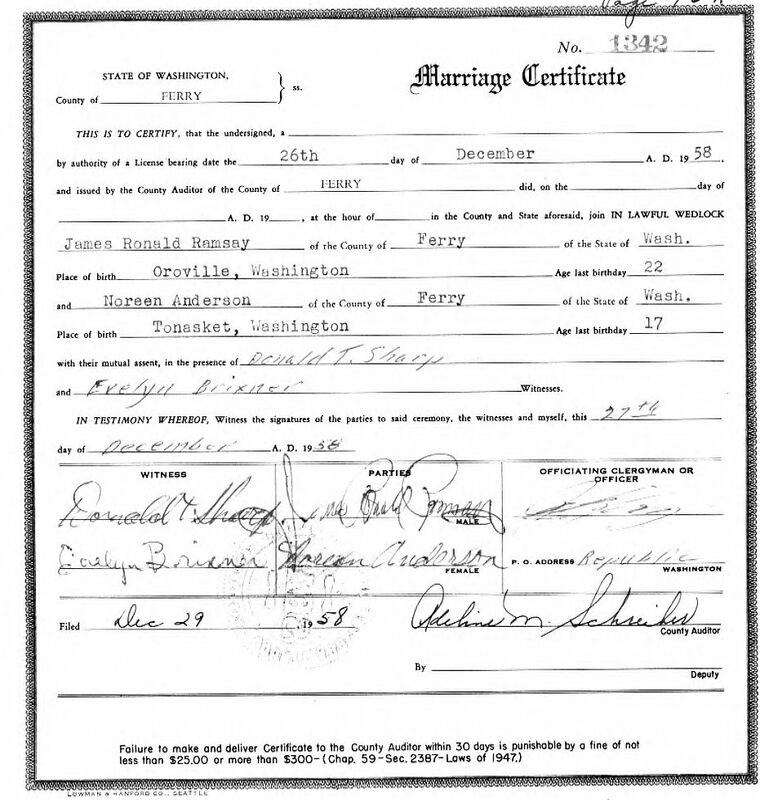 Jim married Ona Martha McKinney in Republic, WA and lived most of his life in Republic, Tonasket and Oroville, WA. 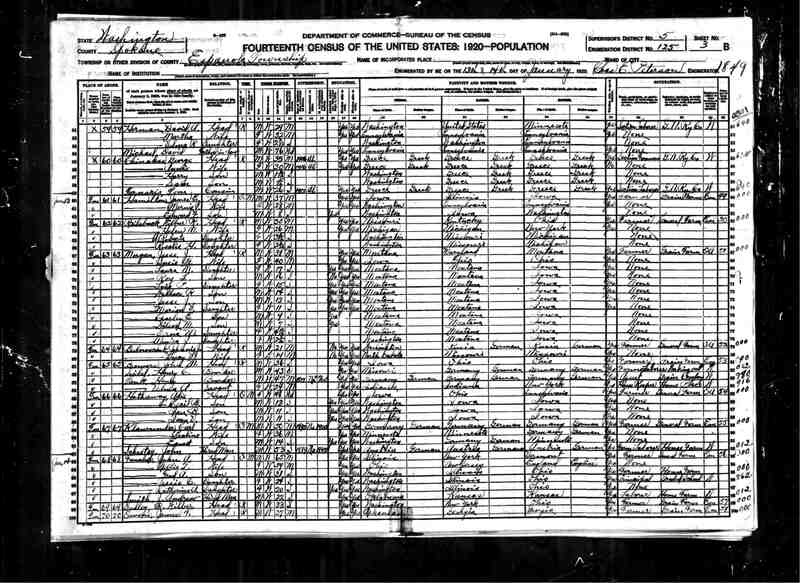 18) James M Hamilton - 1850 US Census - Morgan County, Illinois. James M. Hamilton was a son of John and Altha Judd. He was born in 1834 in Morgan County, Illinois along with his twin brother, William. He was orphaned sometime before 1840. Here in 1850 he is a listed as a 16 year old 'farmer' enumerated along with the household of the older couple, E.W (age 72) and Catherine (age 60) Redding. James enlisted in the 85th Illinois Infantry (Company C) from Mason City on August 27, 1862. He was captured in the battle of Peach Tree creek, Georgia and eventually returned to Mason City where he died in 1869. 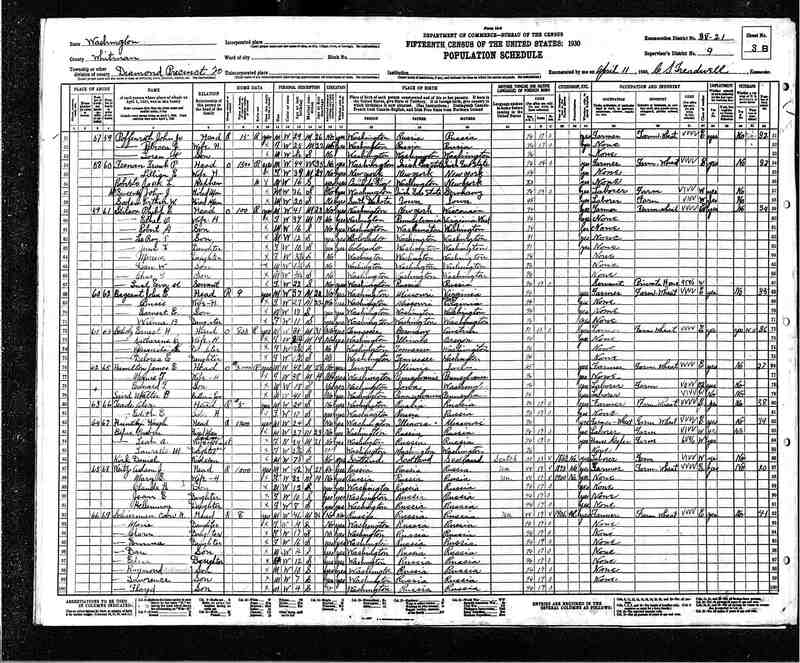 19) James M Hamilton - 1860 US Census - Mason City, Mason County, Illnois. James M. Hamilton was a son of John and Altha Judd. He was born in 1834 in Morgan County, Illinois along with his twin brother, William. He was orphaned sometime before 1840. James was an unmarried farmer when he enlisted in the 85th Illinois Infantry (Company C) from Mason City on August 27, 1862. He was captured in the battle of Peach Tree creek, Georgia and eventually returned to Mason City where he died in 1869. Here in 1860 he is a listed as a farmer enumerated along with the household of Peter W. Bowen. James M. Hamilton was a son of John and Altha Hamilton and the twin brother of William McCord Hamilton. This document shows a copy of his Civil War photo as a Union soldier. It also shows the tribute published in the Mason City News by his Mason City IOOF lodge members. The text of the tributes confirms (by implication) that James left no wife or children. I assume that the brother they refer to is James' twin William McCord Hamilton. James M Hamilton served with distinction in the Civil War. This photo showing him in uniform must have been taken soon after induction as it shows James in his sergeant's chevrons. James was chosen as 5th Sergeant when Company C, 85 Illinios Infantry was formed in Mason City. James rose to the rank of 2nd Lieutenant. He was captured during the battle of Peach Tree Creek, Georgia on July 19, 1864. James M Hamilton was the twin brother of William McCord Hamilton. Both were sons of John and Altha (Judd) Hamilton. The twins were born in Morgan County, Il in 1834. This PDF document contains pages from the Illinois' Historical Records site, Cyberdrive Illinois, regarding James' service. We learn that James initially served as a Private in Company K of the 17th Illinois US Infantry from May 25th, 1861 to May 31st, 1862. James then reenlisted with Company C, 85th Illinois Infantry on July 23, 1862. He enlisted as a Sergeant along with his brother William McCord Hamilton. 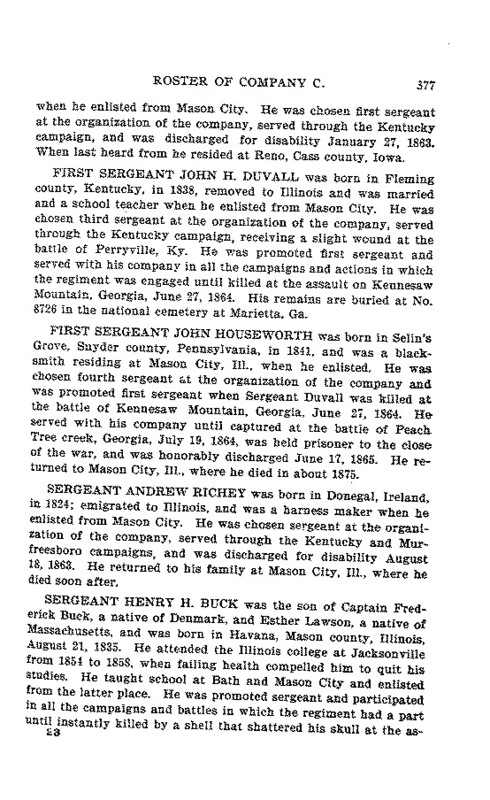 It appears he was promoted to 2nd Lieutenant on March 17th or 30th or 1863 in Nashville, TN and then promoted to 1st Lieutenant on January 1, 1864 at McAfee Church, Georgia. James was captured by the Confederates during the battle of Peach Tree Creek, GA, near Atlanta. He was later released in a prisoner exchange and mustered out of the army from Washington, DC on June 5, 1865. James M. Hamilton was the twin brother of William McCord Hamilton and was born to John and Altha (Judd) Hamilton in Illinois in 1834. He was a Civil War Veteran. This will was dictated by him from his death bed on February 20, 1869. From this will we have confirmed the names of his brothers and the location of his property. We also have confirmed the middle initial of his older brother Supplina P. Hamilton. 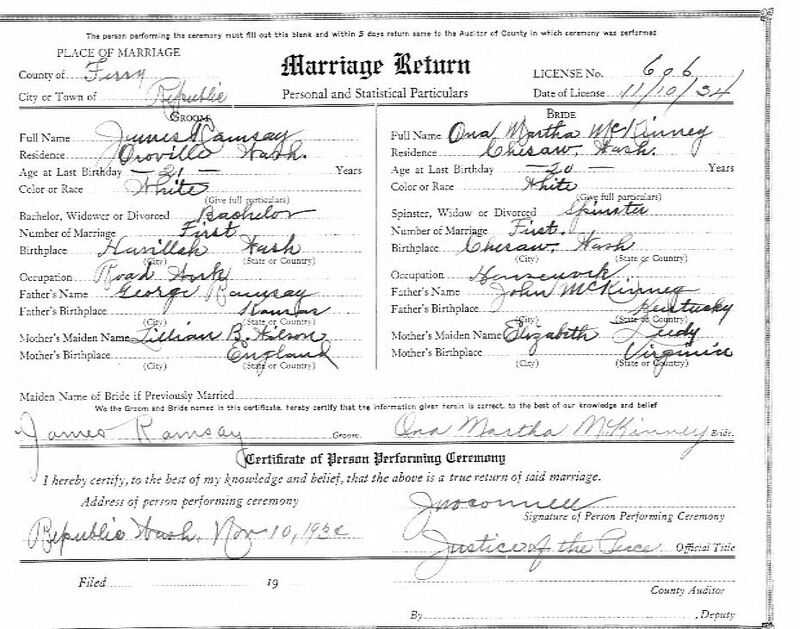 James Ramsay and Ona Martha McKinney Marriage Return, Republic, WA, Nov 10th, 1934. James was the son of George Ramsay, who was the son of James Ramsay and the brother of Lillian Mae (Galloway / Fee) Ramsay. 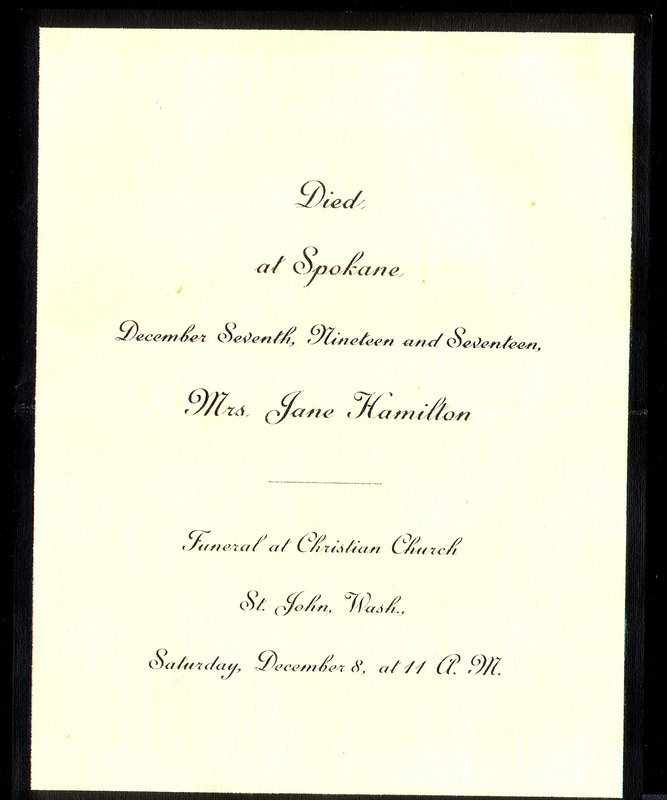 James was a first cousin of Elsie (Galloway) Hamilton. 24) James Ramsay and Jerry (Jeremiah) Stilley in the 1889 Pierce County, WA Directory. 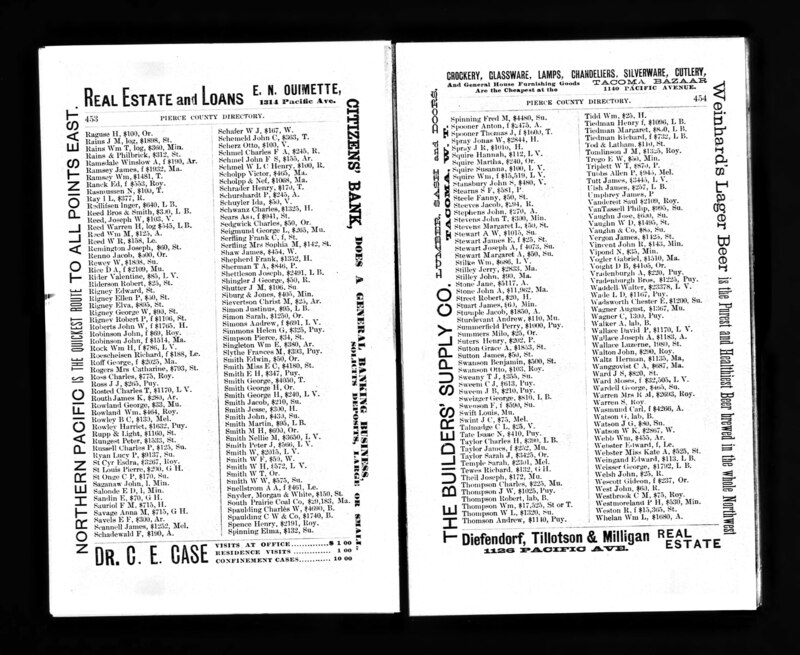 This 1889 Tacoma and Pierce County, WA directory shows the neighboring families, James & Mary Ramsay and the Stilley's living on their farms at the place name of 'Ma' or Marion in Pierce County just northwest of Buckley. The Ramsay home and farm were valued at $1,932. The Stilley farm was valued at $2,833 (2/3 of that land was valued by Zillow.com in 2009 at $991,000). Also, listed on this page is Charles W. Spaulding and CW. Spaulding & Co. both of Buckley. It's certainly possible (likely) that this could have been Mary (Spaulding) Ramsay's brother (also known as Charles W. Spaulding). Charle's property value is listed at $4,690 and that of the company at $1,740. Charles Spaulding followed to Ramsay's and Stilleys to Okanogan County and died there in 1928. This section on the James Robert Ramsay and Mary Adelaide (Spaulding) Ramsay family is taken from the work: Trails and Tales of Early-Day Settlers of North-Eastern Okanogan County, compiled by the Wauconda Historical Committee, Wauconda, WA. James Ramsay was the father of Lillian Mae Ramsay (Galloway / Fee) who was the mother of Elsie Luetta (Hamilton) Galloway. James Ronald Ramsay is the son of James Ramsay and Ona Martha (McKinney) Ramsay, the Grandson of George Ramsay and the GGrandson of James Watt Ramsay. James, Mary and family are found in the Puyallup Valley Precinct in 1880. The census taker got James' age wrong (he was 19 years older than Mary). Family stories put them in the vacinity of Buckley, WA at this time raising hops and quite prosperous. Speaking of hops production in the Buckley / Enumclaw plateau here is an excerpt from Historylink.org that speaks of that era: "The plateau developed as a farming area. For some farmers, growing hops (used in beer-making) brought prosperity: In the 1880s and early 1890s the area experienced what might be called a hop craze. But then a local infestation of hop lice and a drop in the world commodity market caused many farmers to turn to dairy, and dairy farming remains a major industry. Farmers found ready markets for their produce with railroad workers and in the mining communities of Franklin, Cumberland, and Black Diamond that border on the plateau." 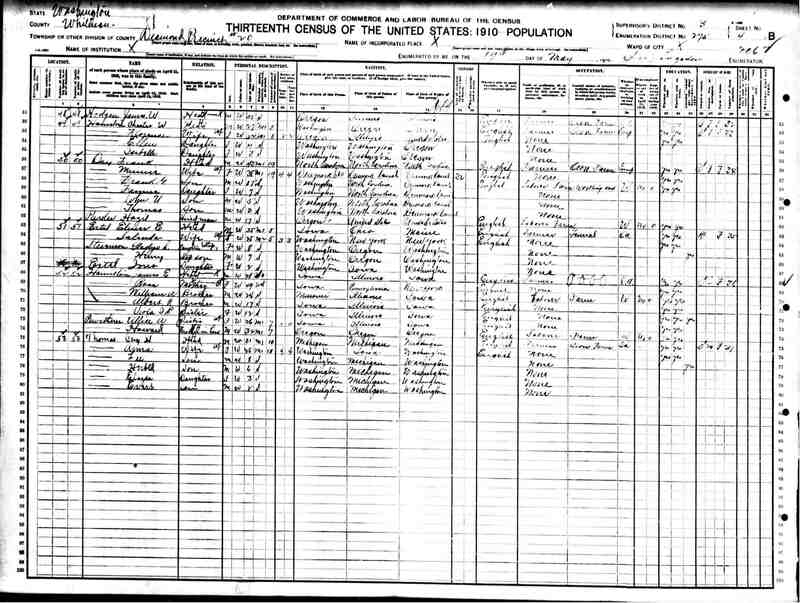 The Stilley Family: It's interesting to note that per the 1880 Census (in the Puyallup Valley) and in the 1900 Census (near Wauconda) (the 1890 Census was lost to fire) that James and Mary were living right next to Jeremiah and Maria(h) Stilley and their large family. Mom (Julia Hamilton) writes in her family history notes that James and Mary were friends of the Stilleys and that the two families travelled together via covered wagons. Mom's notes record how when they moved from Pierce County to Wauconda in North Central, Washington they had to ford all the rivers with their wagons. They must have been very close friends to spend 25+ years as neighbors and move together. Jay Perkins Templeton was the son of Greenberry Shields and Hattie Templeton and the half brother of Julia Aletha 'Letha' (Hamilton) Templeton and Laura Annettie 'Nettie' (Hamilton) Templeton. He died in July 31, 1978 at age 84.